The first day of school couldn't have begun more perfectly. I woke up at 6:30 a.m. expecting the kids to wake up any second. They didn't arise until around 7:15, which made me wonder if I'd be super late to work on Day One. And while we're on the subject of wondering, why on God's green earth couldn't they have picked a similar wake up time last week when we were still on break? I got the chance to get myself dressed and ready, to prepare their breakfasts, and to make sure they had everything they needed - lunches, snacks, loveys, blankets, diapers, wipes, etc. It helped that Hubs was going in to work late to help out and see everyone off. We left the house a record breaking 1.25 hours later - at 8:30 a.m. I'm not sure how we got everyone fed, clothed and groomed so quickly. I hope it's a trend. 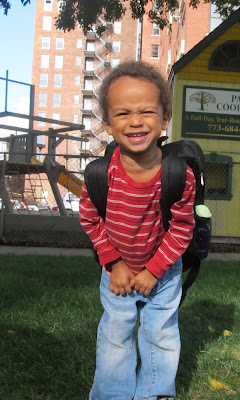 * Part of it was because Riley couldn't wait to get outside with his new Thomas backpack. And Aria, who is still pretty easy to hustle around, (except for combing her little ringlety boing-boing curls), was probably not fully aware of what was going on. I was a nervous wreck (there's a surprise) about drop-offs and getting to work. And Hubs was busy being photographer extraordinaire (see photo above). We piled in the car and drove to destination #1, Aria's daycare, where she hadn't been with any regularity since May. And that's where things became less than fun. With Aria in my arms, I greeted and exchanged pleasantries with B, the owner of the daycare. As I began handing over lunch, a bottle and blankets, Aria, usually not a cuddler, became more and more clingy. She held me tight, her soft little cheek glued to mine. Delicious. I wanted to stay hugging her like that all morning. But I had to go, and I peeled her off and handed her to B. I could hear her screaming as I walked to the car. I knew she'd get over it, but my chest felt leaden. We had been together all summer. No matter how rough some days had been, I missed her already. We drove toward the lake to Riley's school. We found a spot right in front and piled out, Hubs taking more photos. In the classroom, Riley began playing with an excavator (his current obsession is construction vehicles). With his parents close by, he appeared right at home. We stayed with him, showing him different areas of the classroom and meeting his classmates. By now it was 9:15, and I was freaking out a little. I had to be in front of my own first-day students in less than 90 minutes, including a fifteen minute drive and finding parking downtown. I sat with Riley on my lap at the snack table so he could have some cereal, and cuddled and kissed him as I announced I had to go. I told one of the teachers that our time was up. Hubs had already left because we were parked in a loading zone. One of the teachers tried to distract Riley, who was now doing his own cling-on routine. Then, like a pro, she grabbed him off me. He howled and cried for his Mama and Daddy. I fled, again feeling sick. How much of this was I supposed to take? Had we stayed too long? I began blaming myself. And why is it that you long for a break from your kids, and then when you get one, it's like having your fingernails pulled out? I knew both kids would be fine, and they were. We learned by phone that they were happily engaged in activity less than ten minutes after the extreme departures; they'd bounced back quickly. Emotional separations from your children are heart-rending, even when you know you will see them again - even when you know the apart time is finite. As I trudged away from my squalling babes, my tendency toward the catastrophic turned my mind to mothers torn from their babies, mothers who probably would never see their children again. Never. Slaves, Jewish mothers during the Holocaust, incarcerated moms, immigrants past and present, as well as mothers with sick children. The unimaginable horror these women experienced made me see how lucky I was, how lucky we middle/upper class mothers are. We can drop our kids off in places where they'll be safe and thrive. Where they'll play outside on a beautiful September day. Where we have a say in their care and know that their caregivers are competent and loving. And if they're not, we can go elsewhere. We get to do our jobs, jobs that are for the most part fulfilling. I am blessed that my kids are adaptable little people who had great days after the initial drama. And I learned that all the stress about this day did no one, not my family, not my dearest girlfriend in the world, and certainly not me any good. So once again, evoking the spirit of Scarlet O'Hara (I know, I know, don't even go there...), "If I have to lie, steal, cheat or kill, come next year, I will say fiddle-dee-dee to you, Mr. Labor Day!" My son also barnacled himself to the left side of my body for the first 5 minutes in the classroom. It's such an emotional moment and then you have to WORK. Arghh! Hard not to stress, but ...of course your sweet boing boing curled babies are doing great! Well said once again KB.